For over 1500 years stevia sweetener has been used in central and South America. The Japanese have used this shrub for decades and commands 40% of their sweetener market. There is an ongoing controversy about the safety of stevia sweetener. If the Japanese have used it for many decades, this is enough of an endorsement for me. The Japanese are one of the healthiest nations on the planet. It was approved for use in the USA in 2008. The uniqueness of stevia is that it is 150 times the sweetness of sugar and has basically no calories. The concentrated extract is 250 - 350 times sweeter. The green plant is processed into a white powder similar to table sugar and also produced in a liquid form. Some extracts have a somewhat bitter aftertaste. You need to find the brand that satisfies your palate. 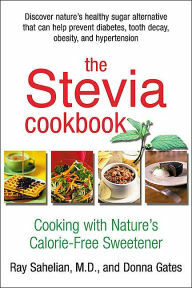 Baking with stevia poses different problems. You will have to increase the bulk of other ingredients and decide whether to use the liquid or powder form. We have purchased stevia plants at the local farmers market that will allow you to have your own sweetener growing at your home to steep in teas or to make syrups. Sugar or Stevia Sweetener...which will it be? We all know by now the detrimental effects of refined sugar and its presence in almost all processed foods. Refined sugar is now considered to be an addictive substance that helps to create obesity with all its many health hazards. Sugar adds calories and negatively impacts the heart, pancreas, liver, belly and brain. This wonderful stevia plant can replace sugar and also can have a beneficial effect on your health. 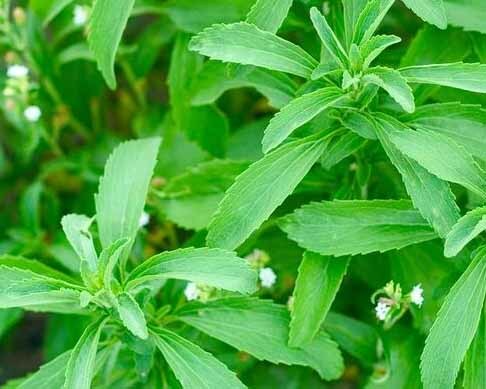 In a study in March 2017 by researchers in Belgium and the United Kingdom, they found that stevia activates a protein that releases insulin and helps to manage blood sugar after eating. It is a natural food as compared to many of the harmful chemical sweeteners added to colas and processed food. It is safe. If you are trying to lose weight or you have decided to reverse your current health problems, then the zero calories of stevia can be a monumental factor in supporting your new lifestyle. Stevia comes in both liquid and powder forms. The liquid comes with flavors like lemon, caramel, and chocolate. One teaspoon of stevia powder or liquid equals one cup of sugar. Powerful stuff! There are many different brands in the marketplace. Our favorite is NuStevia. They make powder, liquid (both plain and flavored) and a more concentrated extract. In my opinion, there is no bitter aftertaste. A friend of ours likes the Stevita brand which is all organic, Kosher and non-Chinese grown. This brand is found mostly in health food stores. The advantages of stevia sweetener are many. I hope you will give it a try and help to reduce the sugar imprint on the health of the planet.